I discovered this magazine recently, after Philip - the editor - commented on one of my blog posts, and we later exchanged email. Magazine is based out the UK and is pretty damn cool. Don't expect reviews on the latest carbon fiber widget, how to train for a century, or the latest in Powerbar technology (burp). 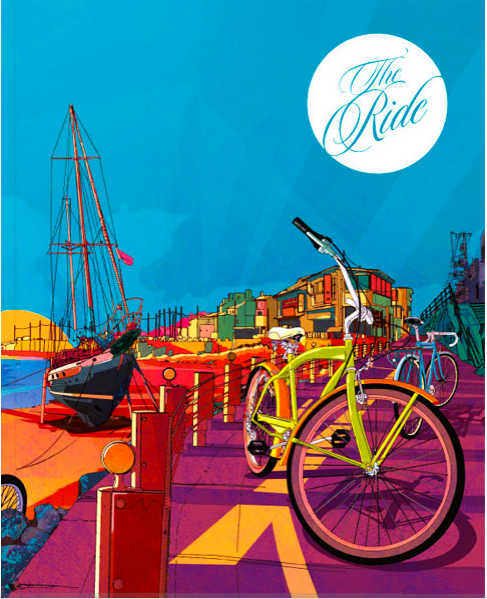 This magazine is about riding itself - expressed though short stories, cool illustrations, and interesting photography. It's not something to flip through in 15 minutes. No, it's actually something bike related to sit down, read and enjoy. Very well done publication. Another aspect I dig about it - not pigeon holed into being a road or mountain bike magazine - it covers all aspects of our little subculture. That opens up a broad spectrum of ideas and influences the bicycle world offers and makes for more interesting reading. The stories come from regular riding folk, to more famous names like John Tomac, Greg LeMond and Charlie Kelly. Very cool indeed. The magazine is available in actual paper or online. You can download previous editions for free in PDF form, read posted online articles, or purchase the latest copy. You won't find this mag at the local bookstore here in the US, so cruise on over to their site. The Ride Journal - it's worth a look and a read. Give it a go, let me know what you think.